Azurilland was shut down on November 8th, 2018. You're viewing an archive of this page from 2018-11-01 at 17:02. Thank you all for your support! Please get in touch via the Curse help desk if you need any support using this archive. Hello everyone! Welcome to the next installment of the Azurilland Top Fives. 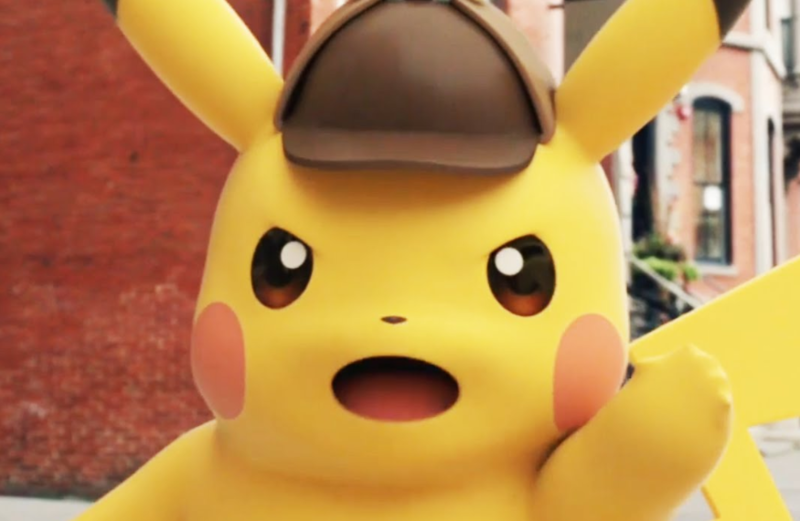 In this top five, we will be focusing on the top five generations of Pokémon. Each entry on the list will feature Azurilland members who I believed best summarized what makes each each starter great. Each entry takes the whole evolution line into account. I encourage you all to talk about your own favorite generations of Pokémon. Not only this article, but in the main thread. With that being said, lets get on to the list. *Though at first, many people did not care for Popplio, that certainly changed once Sun and Moon were released. *Primarina’s typing and elegant design appealed to many. Quote from Gokey Pokey: When most people first saw Popplio, they didn’t much care for it. But I loved the little performing seal. It’s red nose is adorable, and as it evolves, it goes from cute to beautiful. Primarina is, in my opinion, one of the most beautifully designed pokemon. It has a very elegant look, and has a Typing to match. On top of that, it has some wonderful stats, and has a very diverse movepool that make it a great addition to any team. Plus, it has access to it’s hidden ability, making Hyper Voice a powerful STAB water-type move. Quote from Scrafty: When Sun and Moon were first announced, a fair amount of people hated Popplio. 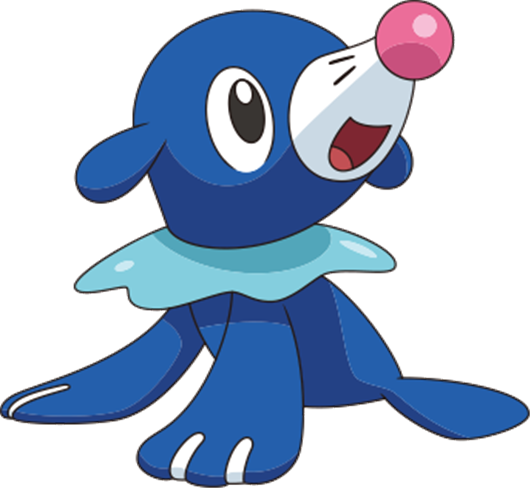 However, I loved Popplio's cute, goofy sea lion design at the start and I was set on having it as my starter and it was phenomenal to use. After it evolves to Brionne, it becomes a sightly more goofier sea lion, adds more circus performer aspects, keeps its cuteness, and its eye becomes more interesting with a pink pupil instead of white. Finally, it transforms into Primarina, a mermaid sea lion which maintains the performance motif and even uses its singing to lure its prey! Everything about its design is elegant: the hair, shells, pearls, and frills flows well without clashing, the colour scheme is pleasing to the eyes, and its eye becomes much more unique and sea lion-esque. *Cyndaquil and Quilava are cute. Typhlosion is a beast. *To many members of the community, the Cyndaquil line was their first starter. Quote from Dawn Dratini: The Cyndaquil line was the starter I chose on the game I have played the most, so I'm familiar with it. But my appreciation for this line goes beyond that. It's easy to see, from their designa, that the line is strong. 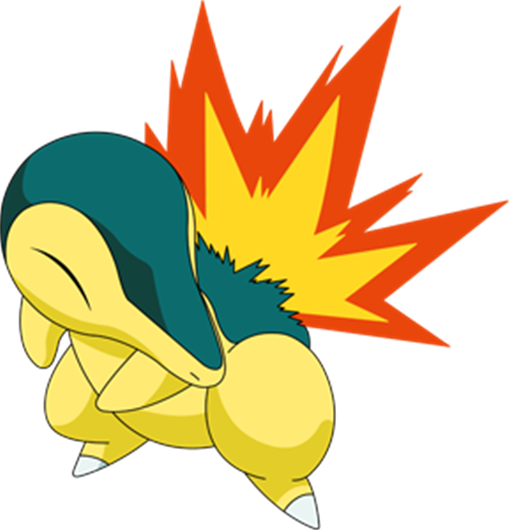 Cyndaquil starts as a rodent who can control when flames come from His back, unlike other Pokémon who can't control this ability. It's also strong and can hold its own during the game. Quilava is still cute, but looks stronger. I really enjoyed Typhlosion being able to stand on his hind legs, but I can totally imagine it as a bear, having the ability to stand on both four legs or two. It would also growl and act somewhat similarly to a bear and yet still being gentle and soft when it needs to be. Quote from Flo:Goold old firebutt, the best starter for the Johto Journeys. Cyndaquil has always had an cute appeal to me, especially since I loved the Camp Pikachu short as a kid, where we have to 'light the campfire with Cyndaquil'. Quilava is the best designed in the evolutionary line, having the sleek design which is complemented by the fire, and Typhlosion has the rugged, and rather fitting, explosive design of the crest of flames. 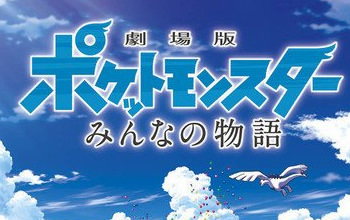 The Typhlosion in the Pokemon Chronicles short Raikou: The Legend of Thunder was also a real cool kid. *The line has a good balance of being both cute and cool design wise with a magical charm to it. *Azurilland members were overall fans of foxes. 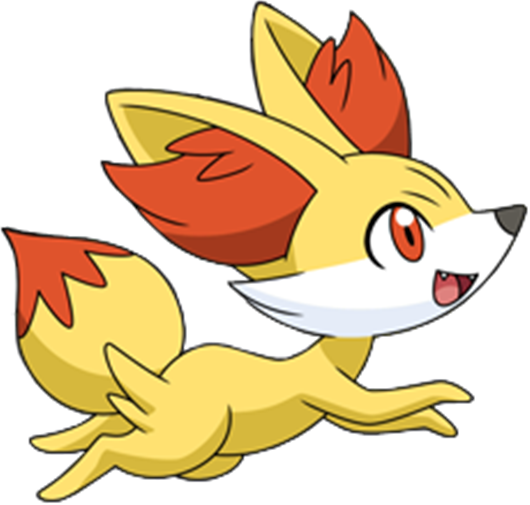 Quote from Pendraflare: All the crap that this one gets, I find Fennekin and its evolution line to be quite underrated. Braixen is a cool middle evolution as well, especially since it can shoot fire with a stick that it keeps in its tail. How cool is that? And Delphox itself, being based off a magician, is something I tend to like a lot, with decent stats around the board and a design I like much more than many. While many were turned off by the final evolution, I was not one of them. Quote from Dregran: Since it's the whole evolution line, I'll put in Fennekin. It has a great concept, and the progression to bipedal and more mage-like attributes is a nice effect. Fennekin is a really cute fox Pokemon, which is already super duper cute and most of the reason why it's on my list, but Braixen and Delphox each having their own charm has me sold. 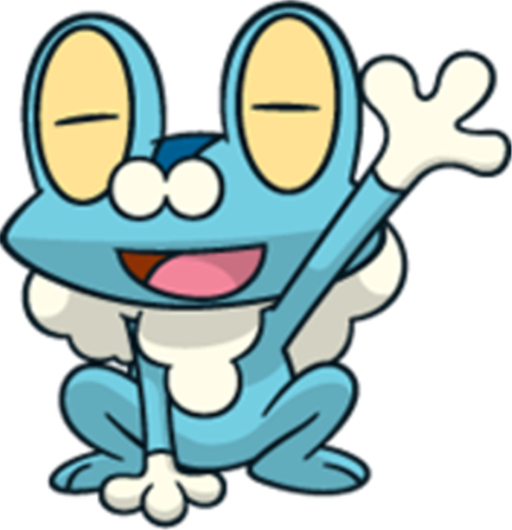 *The designs of the Froakie line were overall very well done. Especially shiny Greninja. *Protean makes this line a force to be reckoned with in the competitive scene. Quote from Quilly: Smash 4 bias? Maybe. But honestly, the Froakie line as a whole is very fun to use. Froakie itself learns the strong Water Pulse before it even evolves, and Frogadier learns great utility moves. Greninja is awesome all on its own; a great well-rounded Pokemon with respectable speed to compliment its great attack stats. And with a versatile movepool with moves like Spikes, Mat Block and even Rock Slide, Greninja can offer more than just a relentless all-out attack. Also, Ash-Greninja is the coolest Pokemon to ever be featured in the anime, don't @ me. *Only weakness is grass (Marshtomp/Swampert). *Can be used very easily in the Hoenn games because of its typing. *Mega Swampert’s design is pretty awesome! *Gives a sense of nostalgia to many Azurilland members. Quote from Franciscoasta: Memes aside, there's a lot to like about Mudkip. First off, its first two evolutions look adorable. Second, its evolutions boast the great Water/Ground typing, which, white only one weakness and fantastic coverage, make Swampert a force of nature. Plus, it can be used in pretty much every gym in Hoenn, as well as during the E4, since there's no trainers that specialize only in the Grass type. All in all, it's a great Pokémon that will fit on every team. 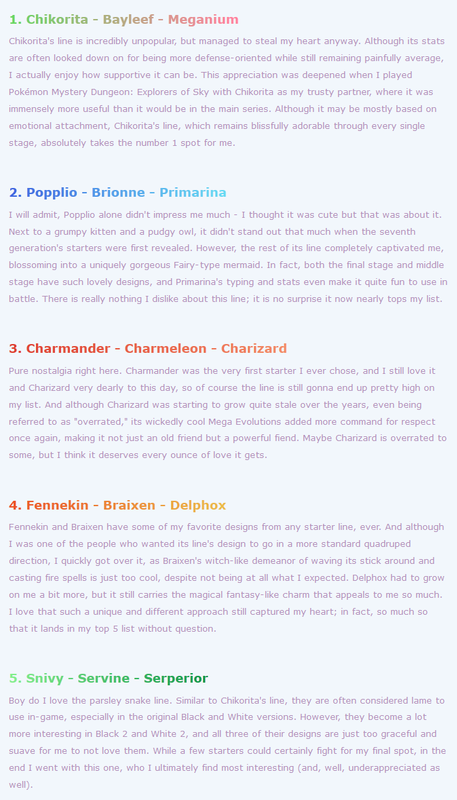 Quote from ~Kilza~: For me, the top starter has to be the one I started out with ages ago. 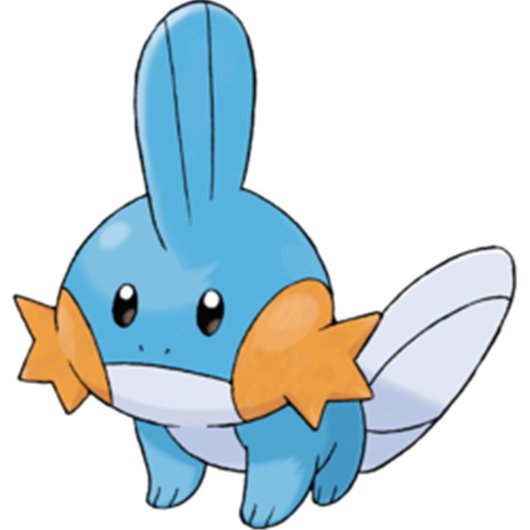 Pokemon Ruby was my first game, and Mudkip was my first starter. I basically solo'd the entire game with Mudkip's line, and would eventually get it all the way to Level 100. It ends up being a solid choice, as it's only weak to grass and has a good variety of moves it can learn. As well, I like the design of all 3 stages, and it was a meme before they were even widely called memes. It's great. Nothing can top it for me. Quote from Crystal: I usually don't care for the Grass starters, but Rowlet is one of the two exceptions. Rowlet just has that build that makes you want to hug it forever. I even have a large Rowlet doll that I bought a few days before Sun and Moon came out. It's especially endearing in the anime, where it's so sweet and naive on Ash's team. As with many mid stage evolutions, Dartrix is one I'm mostly indifferent to, but I do think is more interesting compared to most where they can look mediocre. Decidueye didn't disappoint when it was officially revealed to the world (as some may now, the art of the final stages in Gen 6 were leaked many months in advance somehow). It's typing is so unique and unexpected, and of course I have to gush on how damn cool it looks! I love my moody archer owl, and altogether this makes for a very solid line. Quote from Smotemotem: Charmander was my very first Pokemon, and that's probably true for the majority of first gen trainers. The iconic dragon-like design has made Charizard one of the most recognizable and appealing characters in the series. As a first gen starter, Charmander will be featured on merchandise for the forseable future, too. It wasn't competitively viable for several years, but it was so popular that it received two different mega evolutions in sixth gen. Both of these new forms are great for competitive play, and all of the Charizard forms look great in their shiny forms. We also can't forget about how sought-after those Charizard base set cards were, just because of the popularity of this Pokemon. Quote from thexuberant1: Squirtle is my favorite starter Pokemon. It’s very useful in battle as it has great defense stats. Squirtle is very memorable to me because it helped me get through Rock Tunnel. It’s final evolution, Blastoise, is the coolest water type starter in my opinion. It’s a turtle that shoots water from it cannons, which is really awesome. Plus Squirtle is so cute. Who couldn’t resist a baby sea turtle? Quote from Shhmew: Chikorita's line is incredibly unpopular, but managed to steal my heart anyway. Although its stats are often looked down on for being more defense-oriented while still remaining painfully average, I actually enjoy how supportive it can be. 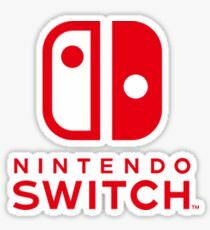 This appreciation was deepened when I played Pokémon Mystery Dungeon: Explorers of Sky with Chikorita as my trusty partner, where it was immensely more useful than it would be in the main series. Although it may be mostly based on emotional attachment, Chikorita's line, which remains blissfully adorable through every single stage, absolutely takes the number 1 spot for me. Thank you to everyone that participated. If you have any questions about how the list was determined, please do check out the main thread and feel free to make your own lists of your top five favorite Starter Pokémon! Popplio was my #1 pick, so I'm glad that it made it onto this lineup. And yeah, I do like Fennekin way more than most do so that's a good one to have seen made it. Didn't think it would, though! If anyone is curious of my rankings, I just screenshotted my list since it includes the reasoning lol. It was actually rly cool seeing who ended up in the top 5. Well, I'm actually pretty surprised by these results. Didn't expect Mudkip to be a serious #1, or for Gen 4 to be completely absent from the list (and without even a honorable mention). It's always fun to read everyone's thoughts on their favorite starters, though! Yeah the results were pretty interesting. My top five were Typhlosion, Charizard, Blastoise, Greninja and Venusaur, though I was debating between Feraligatr and Venusaur. Nice that two of those choices made it. I agree that Mudkip was surprising. Also, three of the choices were water types and two were fire types. Oh hey, 3 out of 5 mons I've nominated made the list. The other two I've nominated were the Litten line and the Treecko line instead of the Cyndaquil line (who I'm mostly indifferent to) and Mudkip line (a line I also like for the reasons the community stated). My top five starters are: Chikorita, popplio, oshawott, bulbasaur, and fennekin. Even though some of these starters are often disliked I still love them for their designs. I even use Bayleef and samurott from time to time. I have fond memories of using these in the main story. Chikorita was my first starter so naturally I'd be attached to the evolutionary line. Quote from Pendraflare: All the crap that this one gets, I find Fennekin and its evolution line to be quite underrated. Braixen is a cool middle evolution as well, especially since it can shoot fire with a stick that it keeps in its tail.